Preheat broiler. Spray rack of broiler pan with cooking spray. Place steaks on rack. Spread half of mustard over top of steaks. Broil 4 inches from heat 10 minutes or until browned. Turn steaks; spread with remaining mustard and sprinkle with pepper. Broil 5 minutes more or until medium done (160ï¿½F). Remove from broiler. Cover with foil; let stand 5 minutes. Divide salad greens between 4 shallow salad bowls. Top with tomatoes and drizzle with dressing. Cut steaks diagonally across grain into thin slices. 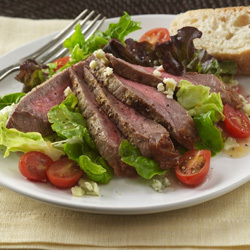 Top salads with steak; sprinkle with cheese.